I've never met Lindsay Clendaniel of Scoop Adventures in real life, but I started following her blog a few years back when I was feeling a bit "homesick" and started searching for blogs about New Orleans. She was living there at the time, and although she wasn't really posting anything about the city, her beautiful photos and intriguing ice cream recipes immediately drew me in. 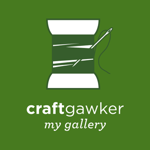 Every time I visit her site I find at least three recipes I want to make RIGHT NOW! (Peppermint Cookie or Black Raspberry Chip anyone?) And if you take the time to scroll through my Frozen Deliciousness board on Pinterest, you'll find an absurd number of pins from Lindsay's blog. 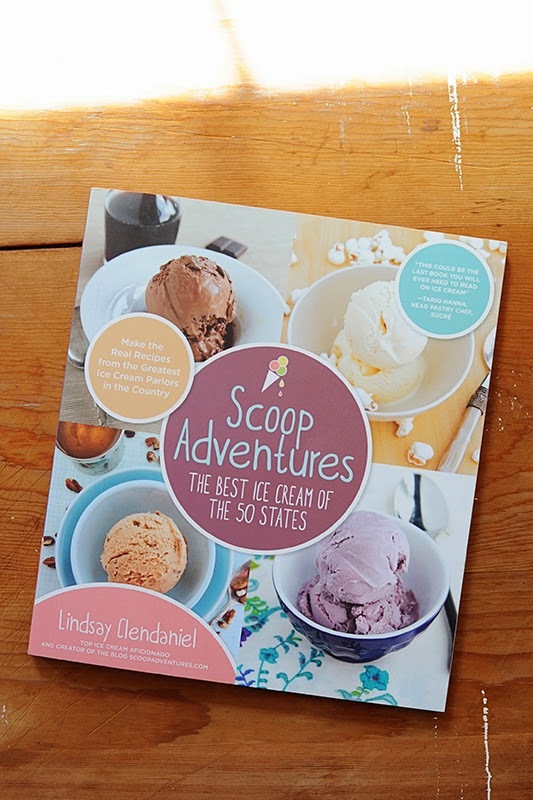 (For real, sometimes I feel like a bit of a stalker...) So of course I was thrilled when Lindsay asked me to be part of the blog tour for her new cookbook, Scoop Adventures: The Best Ice Cream of the 50 States! Most of Lindsay's book is dedicated to recipes she's collected from ice cream shops around the country (at least one from each state). I'm embarrassed to say I still haven't tried the Dark Chocolate Zin from Izzy's Ice Cream here in Minnesota. I know they've been serving it at the State Fair for a few years now and every year I walk into the Minnesota Wine Country booth with the best intentions...but usually leave with a flight of local wines instead of the scoop of Izzy's ice cream I went in for. I won't make that mistake/totally-not-a-mistake again. This summer I'll get both! I'm not sure where I thought I was living when I agreed to mix up a batch of sour cherry ice cream in April, especially when the recipe calls for fresh cherries which aren't in season in Minnesota until the end of July. #rookiemistake Luckily, Lindsay assured me that I could substitute frozen sour cherries, and after stopping at four different grocery stores, I finally found some organic ones at Whole Foods! (Her recipe also gives instructions for substituting sweet cherries if that's the best you can find.) I usually prefer chocolate or minty ice creams, but this was sooo good. I shared a little bit with the family and ate the rest myself! Inspired by the vibrant red sour cherries grown on the western slopes of Colorado, this flavor packs a punch with elements of tart, sweet and tangy. Sweet Action creates ice creams made with fresh and seasonal ingredients, so the owners only feature this gem of a flavor on their menu when cherries are at their peak season. Lucky for you, they have chosen to share their recipe so you can make this ice cream whenever cherries are in season near your home. Combine cherries with ¾ cup (150g) of the sugar and lemon juice. Allow the cherries to macerate in the refrigerator for approximately 6 hours, stirring every hour. Purée the macerated cherries in a blender. Strain through a fine-mesh sieve to remove the cherry skins; reserve the juice. Reserve 2 tablespoons (30g) of the cherry skins and discard the remaining skins. Fill a large bowl with ice water and set aside. Combine the remaining ½ cup (100g) sugar with the heavy cream and whole milk and place over medium heat. Bring the milk mixture to a low boil. Cook until the sugar dissolves, 3 minutes. Remove from the heat, transfer to a medium bowl and set in the ice water bath to cool, 20 minutes, whisking occasionally. Cover and refrigerate until well chilled, at least 4 hours or overnight. 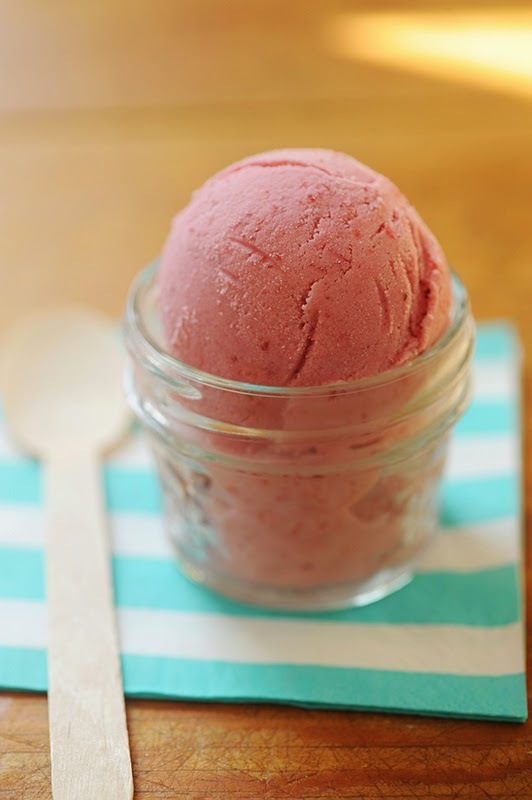 When you are ready to churn, combine the reserved sour cherry juice and the milk mixture in an ice cream maker and churn according to the manufacturer’s instructions. When churning is near completion, add the reserved cherry skins (adjust based on personal preference). Complete churning, transfer to a freezer-safe container and freeze until firm, at least 4 hours. Note: If you cannot find sour or tart cherries, you may substitute sweet cherries. To prepare the cherries, pit and halve before macerating. Add ½ teaspoon citric acid during maceration. The ice cream will not taste exactly the same, but it will still be tart and delicious. And hey, there's a giveaway! You have three chances to enter, but first you must leave a comment below with the most adventurous flavor of ice cream you've tried so far. (I can't remember mine, but I'm pretty sure it had beer in it.) Then click on the Rafflecopter widget to confirm that you've commented and unlock additional ways to enter. Good luck! The winner will be chosen by a random drawing and notified by email within 24 hours of the close of the contest. If no response is received within 48 hours, a new winner will be chosen. Disclosure: I was given a free copy of the cookbook to review, but it was already on my Amazon wishlist when they contacted me, so I would have bought it anyway. Did I mention I stalk Lindsay's blog? The most adventurous ice cream flavor I've tried...probably either corn or durian when I was living in China. Or mung bean. I love corn ice cream! For me it's been some of the kid flavors with the sour extreme, neon stuff in it. Yuck! Peanut butter in chocolate is my fave, though. I'm not so adventurous with ice cream flavours. I'm sure some kind of triple chocolate ice cream would have been my most adventurous kind. Sad, isn't it? If every ice cream shop carried Mint & Chip I probably would be the same way! I've been following Lindsay for years and am so happy she has a book out. Would love to own it. Sorry hit publish too soon. I've tried a lot of strange flavors, but can't eat a lot of them now. Anything with wheat containing baked goods is out. I think my favorite was amaretto cherry with brownie pieces. I'm not very adventurous either. I love black raspberry and it's hard to get me to try another flavor. The tart cherry sounds so good too!